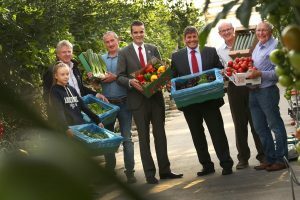 Marking the inaugural National Summer Salads Week in conjunction with Bord Bia (18 -22 July) on Matt Foley’s farm in Rush, Co Dublin the IFA President said “Ireland’s 75 salad crop growers produce crops worth €45 million at the farm gate, with tomatoes and lettuce accounting for €15m of this. Launching Summer Salads Week 2016 on Matt Foley’s farm in Rush, Co. Dublin: Eve McCann; Mark McCann; Paul Carroll; IFA President Joe Healy; Andrew Doyle TD, Minister of State for Food, Forestry and Horticulture; Tom Collins; and, Matt Foley, IFA Vegetable Chairman. Summer Salads Week runs 18th to 22nd July.